Upright meanings: Power, leadership. Earning respect, attracting attention. Reversed meanings: Cruelty, arrogance. Pressing opponents, being tough. A king sits on the throne with a sun-shaped back. The wall decorated with frescoes is behind him. 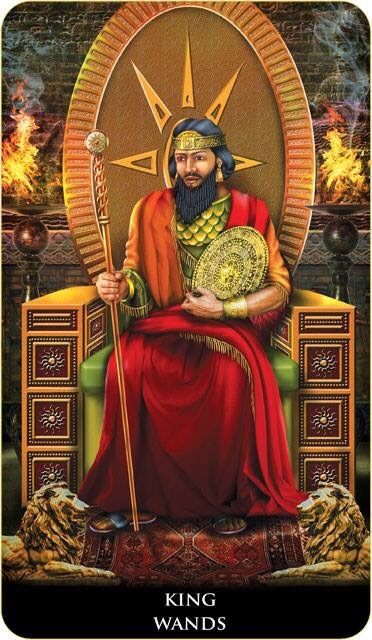 There are burning fixtures on both sides of his throne, symbolizing the energy of this card: Fire. Two lions at his feet, the typical attributes of the Babylonian kings, also symbolize Fire. The king’s image is charismatic and inspiring. – being a powerful, natural leader. – earning respect and willing compliance. This entry was posted in Artist, Deck Review, Featured Card of the Day, General Tarot, Readings and tagged King of Wands, New Babylonian, Roxana Paul, Tarot.